Last Tuesday marked the official first day of spring. Happy Spring everybody! We’ve been talking about air quality and what better way to celebrate springtime and fresh air than a lesson on New York City trees. MillionTreesNYC is a project that aims to plant a million new trees throughout the 5 boroughs within a decade, and the participation of New York City public schools is essential to attaining their ambitious goal! They offer a huge range of programs and curricula for all grade levels. School programs range from year-long green surveying and planting projects to one-day school-wide assemblies to short 15 minute lesson plans for all grade levels. 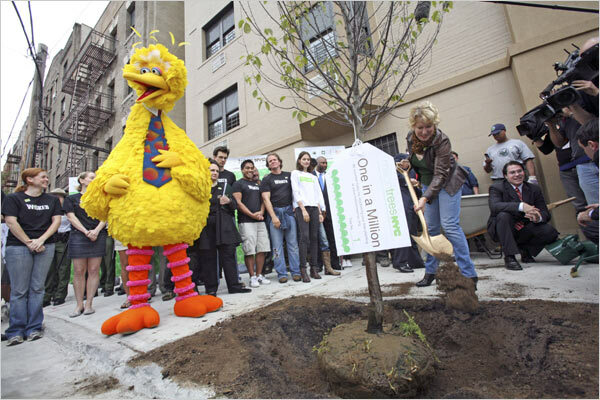 Bette Midler formally beginning the MillionTrees campaign by planting a Caroline Silverbell in 2007. Check out the great Kids Section where you can find a fun tree quiz and a leaf ID game to help your students familiarize themselves with common New York city trees. Take a walk around the neighborhood and take a tree survey! 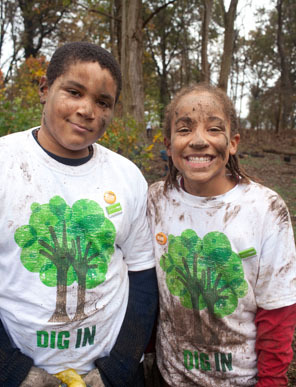 If you find a tree pit that’s missing a tree, MillionTrees can guide you through the process of acquiring, planting, and caring for your school’s new tree. Earth Day is coming up on April 22nd. Spending a day planting trees would be an excellent way to celebrate! As you can see, when it rains, the storm water overflows and the mixed storm water and sewage flow untreated into local rivers. EWWW!!!!!! This is called a Combined Sewage Outflow or CSO and it is major contributor to the pollution of local water. Where does this happen in NYC? 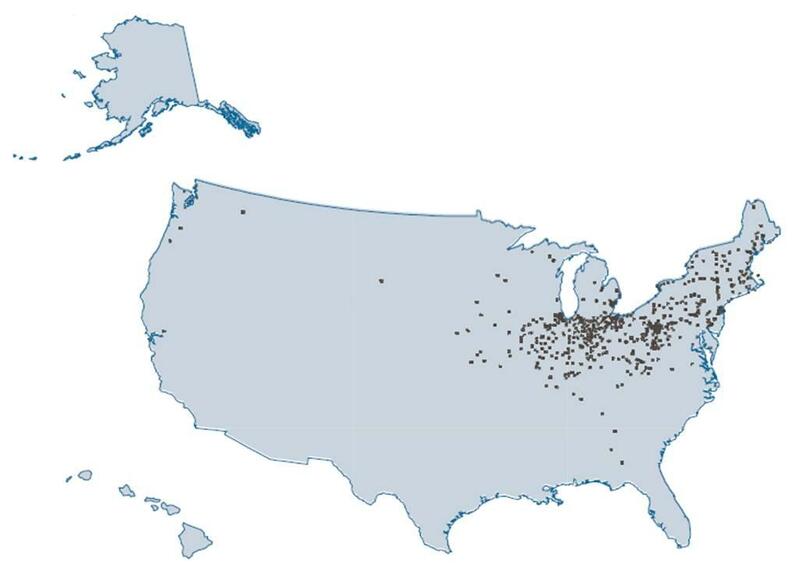 Red Tier 1 dots are where the worst CSOs happen. Now that we see the problem – what is the solution? One answer is better infrastructure, including things like green roofs. The idea is that the right blend of soil and plants absorbs rainwater and then gradually releases it into the storm drains, preventing the overflow. Again, the EPA has lots of information on green infrastructure if you want to learn more. Why are we talking about this now? Well, first of all it’s information that most New Yorkers (children and adults) do not know, and learning new things is cool. But also, we will be talking more on this blog about green infrastructure in the future and we wanted to explain the problem before considering possible solutions. … and don’t forget to check out Icky Fest at Brooklyn Children’s Museum this Saturday for more icky information about NYC’s sewers.